We’ve all had that feeling when we go on a trip. You know, the dreaded feeling of trying to find the perfect places to visit, dine, shop, drink … and golf. You prepare by scanning the web: Yelp, TripAdvisor, Golf Advisor, individual websites, social media, and also talk to friends and utilize any other avenues in an effort to select the best spots and locales in any destination. Sometimes the choices are so daunting that it takes some of the fun and enjoyment out of the whole, darn vay-cay. 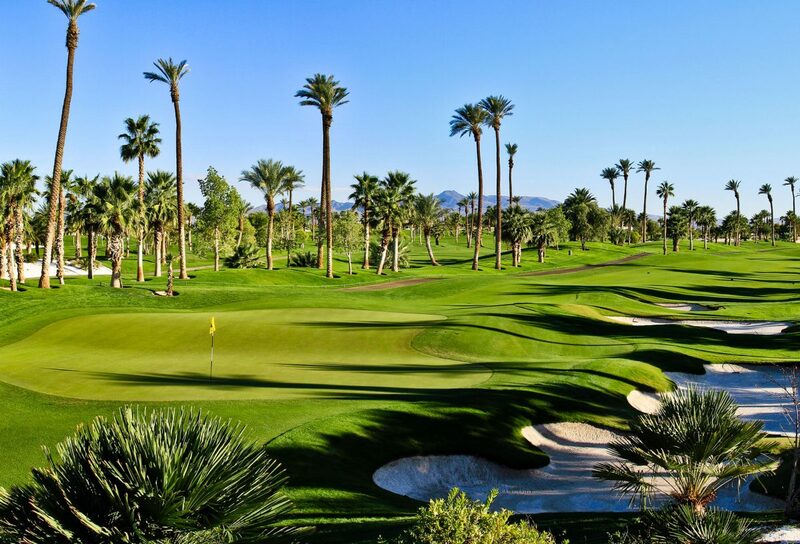 Well, we are here to save you when it comes to golfing in Las Vegas by offering 5 easy ways to select the best jackpot Las Vegas golf course in the Entertainment Capital of the World. It’s hopefully a lesson each of us learns as we go through life. Many (most?) times, the cheapest option isn’t always the best choice. Such is definitely the case in Las Vegas where a large variety of course options are available. Sometimes it’s worth a little more cash to ensure you play a course with character, beauty and quality conditions, therefore guaranteeing yourself the best experience possible. Most likely, you only have time for one or two rounds in Vegas, so do you want to play a top course or do you want to schlep around and play the bargain five and dime, packed in like sardines? Closely related to Price vs. Value is Cost vs. Convenience. For most of us who have figured out this thing called life a little, time is much more valuable than money. 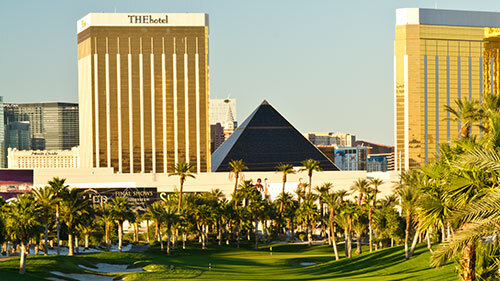 The Vegas golf area stretches many, many square miles so even though you might find a smoking deal on the outskirts, you need to factor into that tee time rate the cost of getting there, both in time and money. If you have to sell your 3-wood to pay the cab or Uber fair to the outlying course, is it worth it? Or, when you rent a car, then you incur the daily rate, hotel resort parking fees (yes, free parking is pretty much a thing of the past in Vegas, but we’ll save that rant for another blog), and worst of all, someone has to drive and that means the designated driver won’t be able to enjoy the golf experience in true Vegas style, i.e. no adult libations for the unlucky chosen one. And that’s the biggest bogey you can make in Vegas. Plus, when you choose a course located near your hotel, you will save a couple of hours on your vacation. You can spend that time doing the thousands of other cool things in Vegas instead of sitting in the back seat of a car, regretting the decision to not play near the Las Vegas Strip with every passing moment and mile. These days, there are limited golf course options near the Las Vegas Strip and in the Heart of Las Vegas, but some sweet ones remain. Next, an important factor in hitting the Vegas golf jackpot is the Fun Factor. Again, you want to choose a course that embraces Vegas for what it is … Vegas! Pick a course that is fun and exciting and offers amenities such as Bluetooth speakers in the cart, the ability to have a beautiful ParMate caddie join the group for the day, offers drink specials during the round, Par 3 wagering challenges, etc. Basically, a course that oozes Vegas from the clubhouse to the course. You’re in Vegas to have maximum fun. Make sure your course selection reflects your state of mind. Another overriding factor in your decision should be selecting a quality golf experience. You want to go first-class when in Vegas, so select a course with quality conditions, great reviews and a challenging, but not overly daunting course whose staff will treat you and your group like the V.I.P.s you are. Overall, your Vegas golf experience should create memories and stories that last a lifetime. If your course decision doesn’t feature unforgettable holes and a setting to match, then it probably isn’t worth your time or money. Yes, the Vegas slogan is “What happens here, stays here,” but that doesn’t mean Vegas hasn’t created millions of indelible moments over the years. Make sure your rounds live up to that criteria. So, there you have it, a few factors that will help you spin to win and hit the Vegas golf jackpot. So, what is our mega Vegas golf jackpot decision? A course that rates the highest in each factor is Bali Hai Golf Club, a tropical golf course paradise located on the Las Vegas Strip and in the shadows of some of the most famous hotels in the world. At Bali Hai, designed by award-winning architects Brian Schmidt and Lee Curley, you will find hundreds of mature palm trees, lagoon-like water features, beautiful bunkering and a stunning clubhouse home to Cili Restaurant and an indoor/outdoor patio experience and event space. The course offers Bluetooth technology, Parmates caddies, Jello shots, model-like beverage cart ladies, VIP service from curb to course and back again, high-quality food and beverage and a par 3 challenge where you can double your money with one swing. 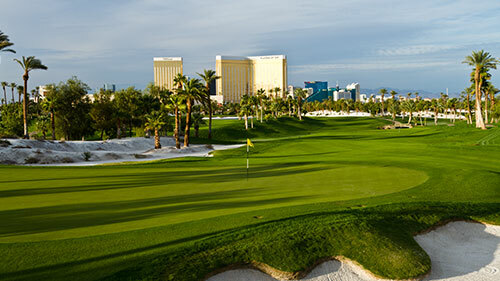 The stunning Bali Hai Golf Club located in the heart of Las Vegas is a golf jackpot and there are many reasons why. Play today. To learn more about the Bali Hai experience or reserve your time today, visit BaliHaiGolfClub.com.